The acres just east of Rock Island’s 30th Street and north of Blackhawk Road overlooking the Rock River valley look like a park. Nearly a thousand years ago, the mound-building Woodland predecessors of the Sauk and Mesquakie Indians recognized the beauty there when they created a resting place for their dead on the property. After the Sauk and Mesquakies were forced from their lands, the gently rolling terrain was used for agriculture. In 1925, the site returned to its ancient cemetery use under the name Memorial Park. 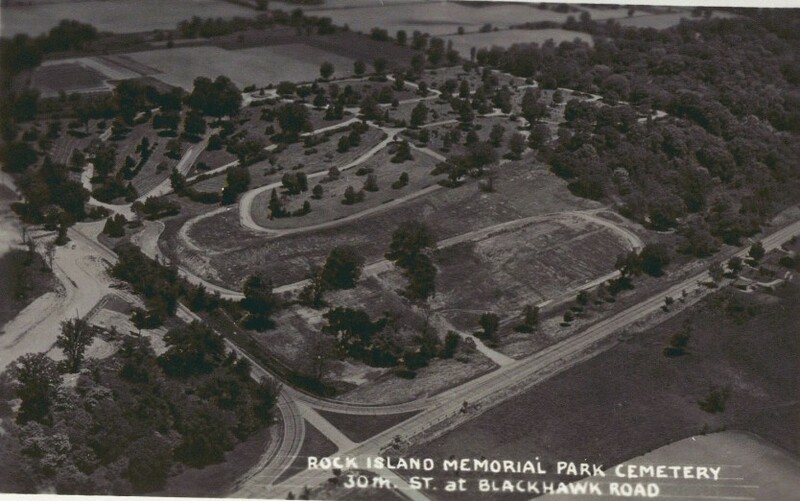 An aerial view of Rock Island’s Memorial Park, as it appeared around 1940, is shown on this’s Real Photo postcard from Shannon Hall’s collection. The Memorial Park Cemetery Association was organized in 1925 with three stockholders, all Rock Islanders. H. H. Cleaveland, Sr., who owned the majority of shares, was prominent in insurance and banking. James B. Eckhart and Ira H. Buffum jointly operated a real estate firm. Their plans called for a new, non-sectarian, cemetery to be comprised of 39 acres of the former Schroeder farm, located outside city limits on 30th Street (then called 30th Street Road) just north of Blackhawk Road, which was called Rock River Road. The three stockholders announced they would retain most of the stock shares, but would sell to sell “a few” shares to other Rock Islanders. The impetus for the cemetery is unclear. It may initially have been a for-profit venture, but that status was soon put aside. It may also have been a perceived need for “perpetual care” to prevent future neglect of the cemetery land. From the very beginning, Memorial Park Cemetery advertised “perpetual care,” a new concept for the 1920s. This meant that, rather than relying on revenue from gravesite sales to provide maintenance, a portion of each sale was set aside in a trust fund. The income from that trust would ensure adequate maintenance long after all the sites are sold, so that that Memorial Park would remain a beautiful place forever. Today this concept is called “endowment care” and it is still in effect at Memorial Park. In 1926, the land was surveyed and the layout designed by local civil engineer Wallace Treichler. He titled his plan “Memorial Park – the Cemetery Beautiful.” Within the cemetery, Treichler named the 20-foot wide winding roads for trees – Walnut, Aspen, Poplar, and Linden among them — while the wider main road was Memorial Way. Treichler’s plan shows three entrances, one on 30th Street, another on Blackhawk Road and a third at their intersection. By the time of the postcard the corner access was gone. Today access is limited to 30th Street. Mr. Cleaveland and his partners announced that D. P. Cronin and William McClain of St. Louis, called “experienced cemetery development men,” would also work on the project, perhaps in the marketing. They may have been associated with the American Necropolis Association, a St. Louis organization that owned cemeteries throughout the country, although we found no evidence that Memorial Park joined that group. Memorial Park was reported to be the first area cemetery with an exclusively Masonic area. In 1938, newspaper articles called it one of the most beautiful cemeteries in the area, noting that 1200 burials had taken place. Today that number has grown to 13,000 and there is plenty of room remaining. Memorial Park now has online help that enables genealogists, families, and historians to search burial records. Look for http://www.rimemorialpark.com/ and click the internment button. In a test of that website, we found that all of its founders and designers – Cleaveland, Eckhart, Buffum and Treichler – chose Memorial Park as their final resting place. Although the Treichler design is largely unchanged, some additions have been made over the years. The cemetery currently contains 59 acres and six mausoleums. The first mausoleum, which also holds a chapel, was completed in September 1967. Another historic addition to the cemetery is an obelisk dedicated to war veterans that was unveiled on November 12, 1939, the eve of yet another great war that would create many more veterans. Mark Huggins is the manager of Memorial Park and secretary-treasurer of its board, following his father George in that position. Both show pride in the beautifully maintained grounds and note that residents from nearby neighborhoods enjoy quiet strolls here. Consider taking your own walk through this historic cemetery. Wouldn’t Memorial Day be an appropriate time? This article by Diane Oestreich is slightly modified from the original, which appeared in the Rock Island Argus and Moline Dispatch on April 18, 2004.